Varieties N12, N36, N56, N57, N27 (which is to be phased out), N59. Varieties David avoids: N21, N33, N29, N31 – he’s struggled to get these to canopy, making them unviable. 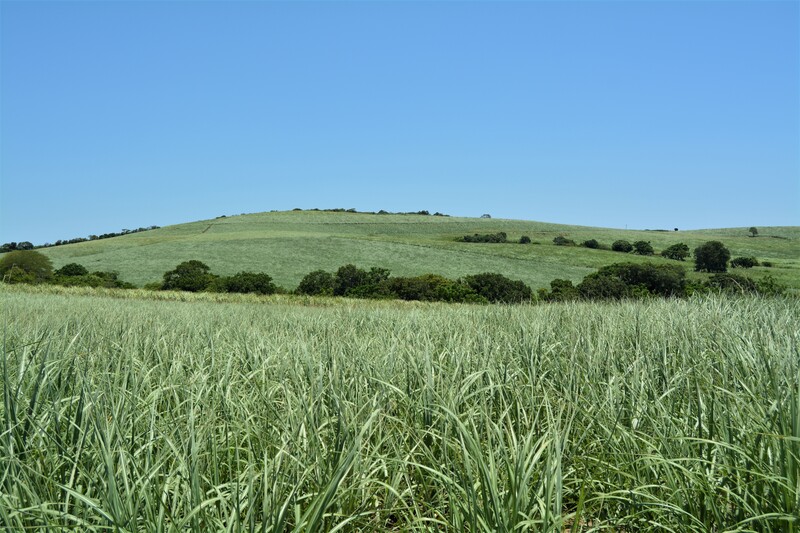 Usually, when I interview a farmer, we flick through the various aspects of what makes his cane farming operation a success; we stay on a fairly straight path with a couple of relevant digressions. Conversely, this interview with David included U-turns, major diversions and completely unrelated discussions covering a myriad of topics. It took me a while to figure out how I was going to present the learnings to you and, now that I have a plan, it’s important to structure the broad scope of this man’s portfolio so that it retains relevance to all cane farmers. The story will therefore include David’s history, his cane farming operation, the biogas plant, and the community-owned business. David began life on a mixed farm in Cardiff, Wales. 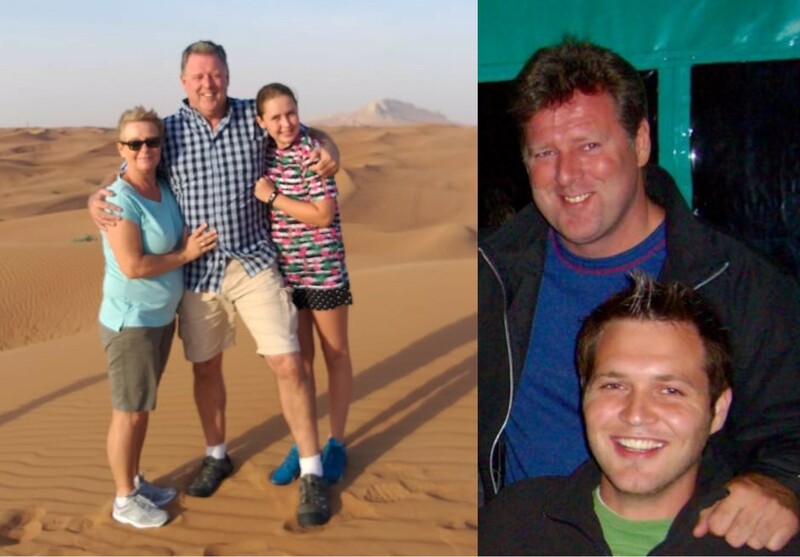 When he was almost 16 the family packed up and moved to South Africa as his Dad began a new career with Iscor in New Castle. Although David had completed his O-levels in Wales, he went back to Std. 9 and enjoyed the last two years of secondary school with South Africans his age. He then completed an engineering degree at University before entering the workplace. A phrenetic pace of studying and racing up the corporate ladder ensued. Once at the top, he didn’t particularly enjoy the climate and looked for a way out. 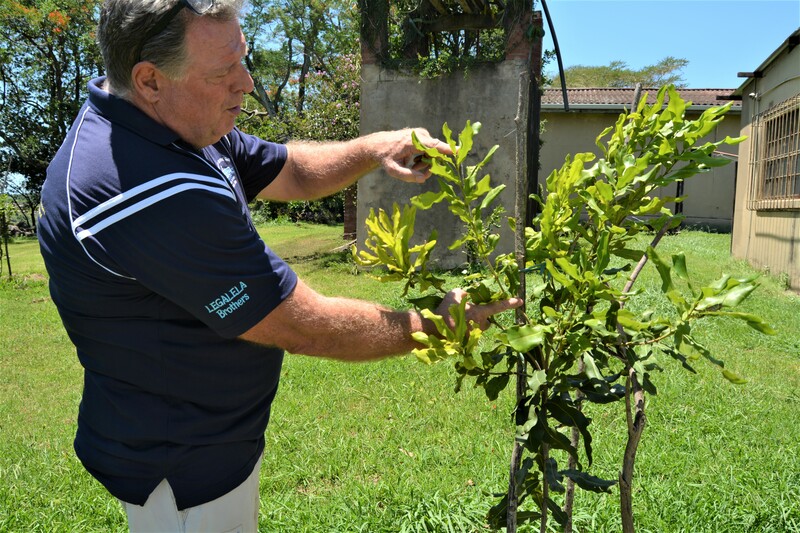 Farming seemed like a good antidote to corporate politics and constant business trips, so, in 1996, he bounced the idea off a good friend, Manie van Rooyen, in Monzi. They spent the next few months looking around and found a farm in Amatikulu; the same farm he has today. The farm was owned by Roger and Betsy Rowe and had been very holistically run, with comprehensive trashing and hand-weeding practices. Roger’s core objective had been to leave the land in better condition than when he had first received it so David got to start his farming career off in a business that not only excelled financially, but its environmental scorecard was exemplary as well. The rich dolomitic soils, prolific throughout the farm, that David is so grateful for. David concedes to being a late developer when it comes to diversifying into other crops. 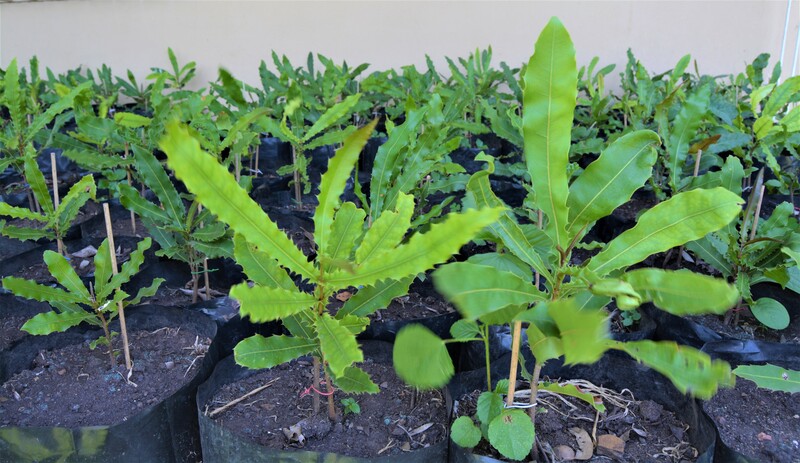 But, he’s currently trying out a few options; a year ago, he planted 20 mac trees (4 different varieties) in the garden and is preparing to put in a total of 30 hectares over the next few years. There are also a range of fruit trees demonstrating their suitability to the climate here. On 15 February the first 10 hectares of macs will go into marginal soils that have been cleared of alien invaders. The next 20 hectares are planned for 2020. Estienne (David’s right-hand man) was busy erecting the fence when I visited the farm. Rather than follow the road, David has chosen to follow the true border of the farm, and thereafter, move the road. These Beaumont-babies were grown from a box of seeds (nuts) that David had traded for an old horse saddle. Through this germination project, they have learnt that a sandier propagating medium (as opposed to the rich dolomite soils from the farm) produce better results. Here David is showing how much growth there’s been, on the macs he planted in the garden, in the last month alone – 12 inches! This tree is not even a year old. 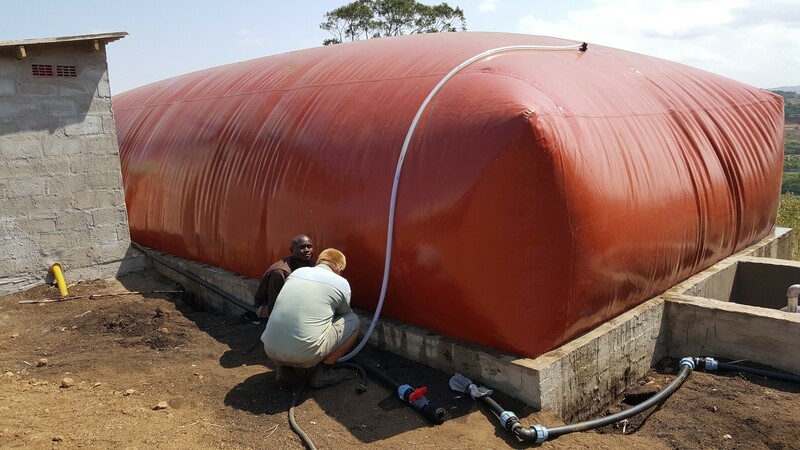 They’ve been using liquid biogas digestate on the macs at the rate of about 5 litres per week. The original holes were dug to 1m3 and filled with liquid mulch compost from the biogas plant. David’s not sure whether this rapid growth rate is a good thing. 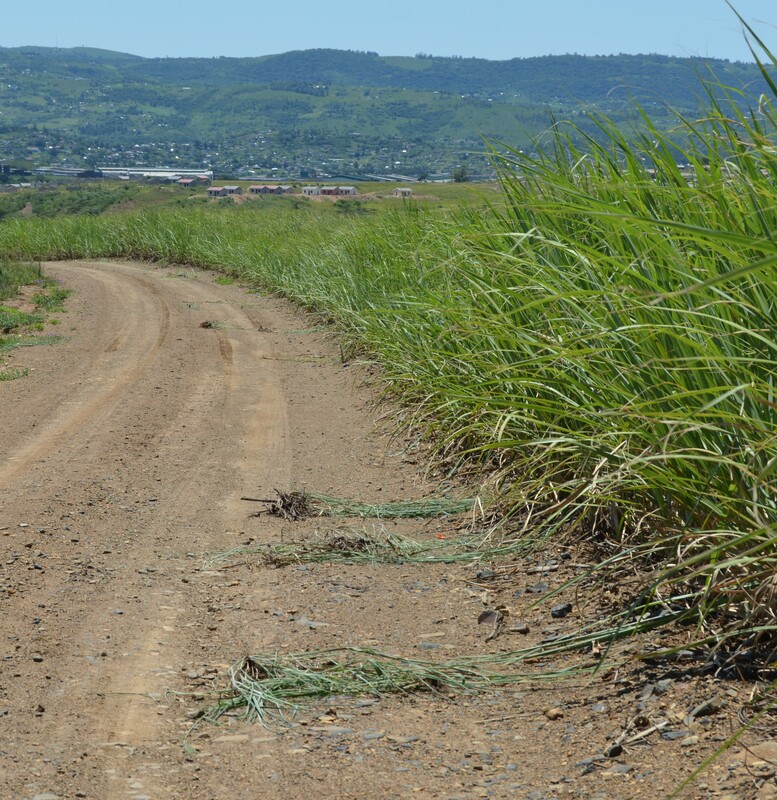 Although this is primarily dry-land country, David irrigated 40 hectares of sugarcane for about 10 years. The disproportionate increase in cost of electricity (this was before the biogas project) as well as the rampant theft of equipment shut the irrigation down. Even though he was only irrigating during November, December and January when rainfall was short, he still realised about 25 tonnes more per hectare than he does now. “Fertiliser applications are best coincided with about 10mm rain – then you can use more affordable urea. Use LAN when there isn’t a high probability of rain so that volatilisation is minimised,” is David’s advice. 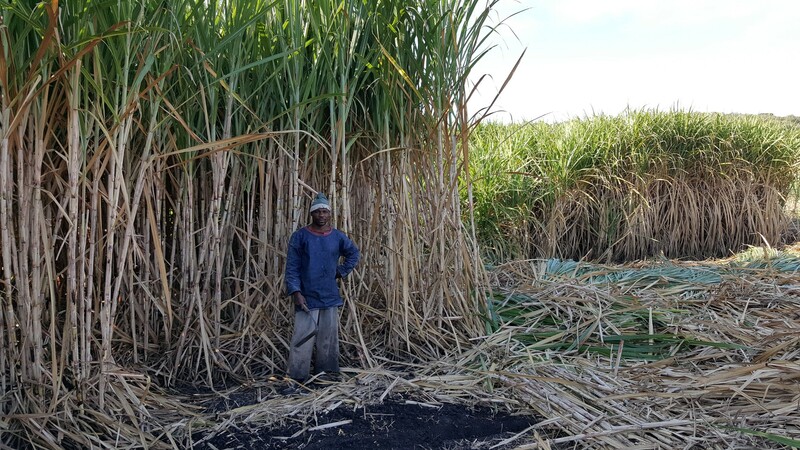 David believes the ideal way to deliver nutrients would be through consistent fertigation but financial viability of that practice on sugarcane is debatable. While David advocates farming in tune with nature, he says you have got to get those weeds out, whichever way is best. Cynodon (kweek) is a toughie and often necessitates a loss of some cane to eradicate it from a field. In an attempt to eradicate Eldana from the area, almost every farmer has been spraying carry-over fields for the last few seasons. 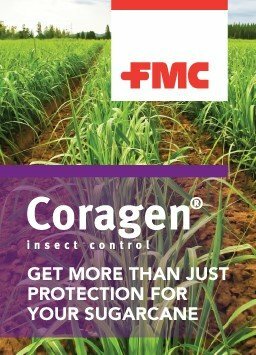 They use Coragen in summer and a pyrethroid in winter. Being holistically conscious, pesticides do not sit well with David and he makes sure that the chemical is responsibly managed for the long-term sustainability of both the environment and the industry. 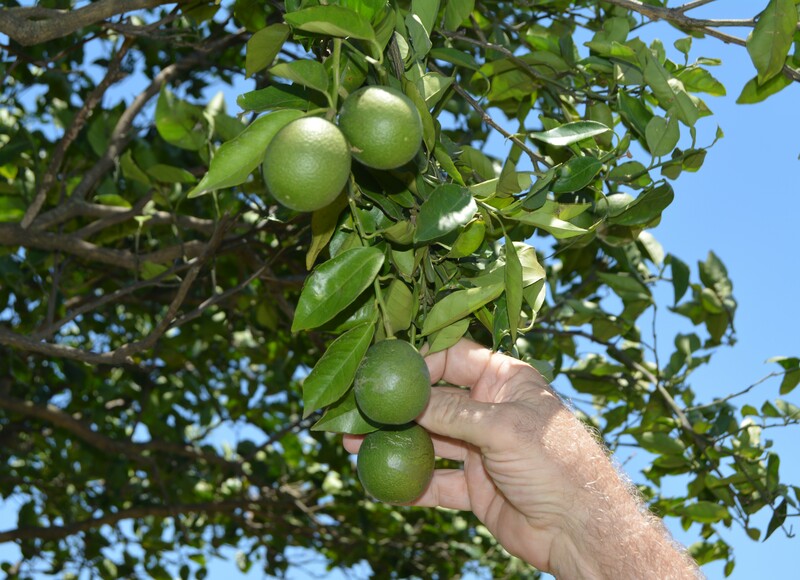 Ripeners are used selectively; wet years and low RV’s call for more intervention but dry seasons often mean that no ripeners are necessary. David is an incredibly open-minded farmer who gives all environmentally-friendly, sustainable options a whirl. In fact, he tried trashing his entire farm for about 5 years. Out of that, he learnt that it’s not suitable for every part of the farm. The trash management requirements (parting the trash to allow sunshine in and water out) of wet valley bottoms coupled with the escalating labour rates make it an unfeasible practice in some parts of the farm. On top of that, the higher cutting rate for trashed cane (approx 25% more than for burnt cane) is also a limiting factor. In addition, there is the higher transport cost of getting trashed cane to the mill. “Bottom line is that there’s a place for trashing and a place where it just doesn’t work. In this operation, we practice both burning and trashing. Ultimately, whatever you chose to do has to be sustainable,” says David. 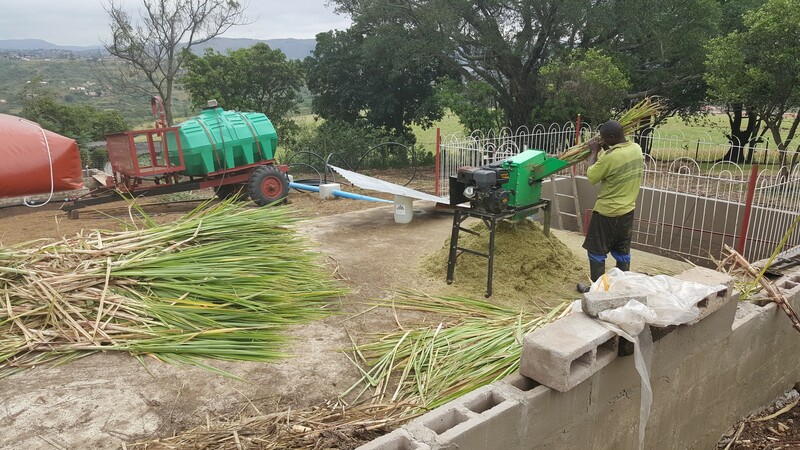 Once the cane is harvested, it is stacked and collected on 5t, tractor-drawn, side-loading trailers. David tried the in-field loading option but the high clay, dolerite soils he is blessed with were having none of it. It only took 5mm of rain to make the fields inaccessible. Besides that, he prefers being able to remunerate the cutters more accurately and thereby stimulate motivation and production. 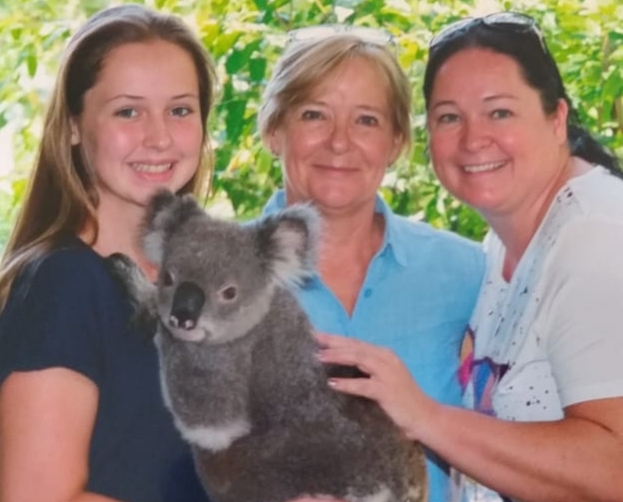 David has just come back from a holiday in Brisbane where his eldest daughter, Shona, lives. Whilst there, he visited numerous cane farms. The average labour units there is ONE per 20 000 tonnes! In South Africa, we average 80 labour units on 20 000 tonnes of harvested cane. Obviously, labour rates in Australia are high enough to have pushed the farmers into highly mechanised operations. An international rule of thumb is that, when a labour unit costs more than US$1 per hour, mechanisation starts to make more financial sense. With the latest minimum wage increase, South Africa is edging closer to that mark and it is therefore David’s prediction that mechanisation in this country will now start escalating. This is certainly not ideal for the soil but essential nonetheless, in order to stay ahead of the viable cost curves of farming sugar cane. Another point David raised, regarding labour, is that we are way past the days of telling labour what to do. We have now progressed into the age of negotiation and mutual agreement – this adds another consideration factor to all farming practices requiring a labour input. My curiosity in this technology was what had initially lured me here. David explains that building the plant was actually his friend, Rex Talmage’s, idea. Although the technology is not new; David’s grandfather ran a similar system on their farm in Wales, creating a closed loop electric system was Rex’s aim. “He’s (Rex) a brilliant researcher and had thought about this extensively,” says David. His plan to embrace holistic farming by incorporating irrigation, electricity, fertilising and manure into one system appealed to David’s engineering-turned-farmer brain. At the same time, SACG, under Thomas Funke’s guidance, was setting up an Innovations Group to make sure that farmer’s innovations didn’t die due to lack of time and investment. David ran with Rex’s idea and SACG’s assistance and started by digging a hole … a rather large, 200m3 hole. Having never laid a brick or mixed a barrow of cement in his life, David was grateful for Invotec’s investment as they delivered the resources he lacked. Together they all brought the project to life and the plant has been running for about 3 years now. It is, and always will be, a test facility where they experiment with different organic materials, assessing outcomes and possibilities. 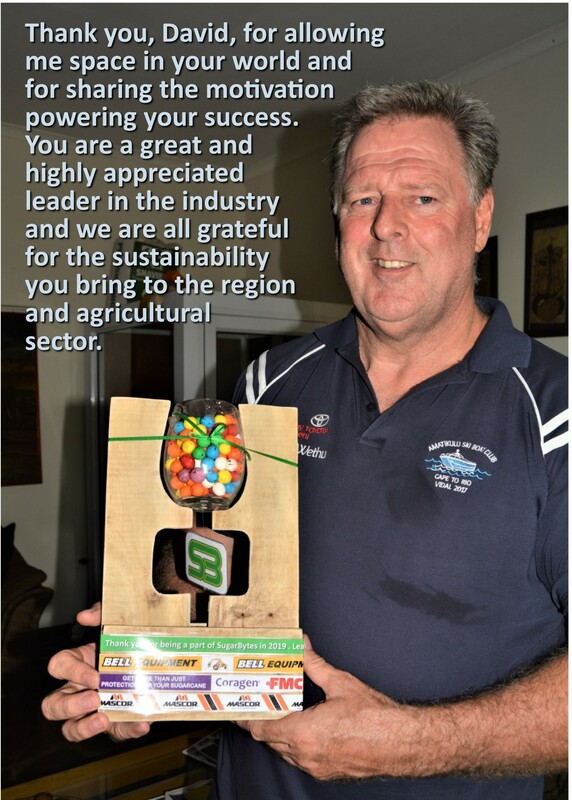 All information is available to growers through SACG Innovations Group. 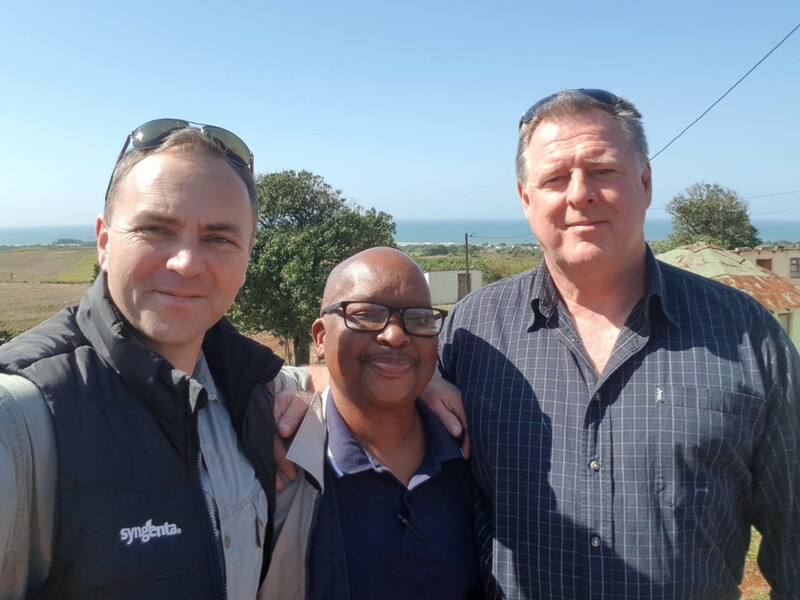 Rex Talmage, Thulani Majozi (MCC Chairman) and David. My simple brain found it easiest to understand that the plant is actually just a large concrete bovine stomach. The gas emitted by the stomach is used to generate electricity. 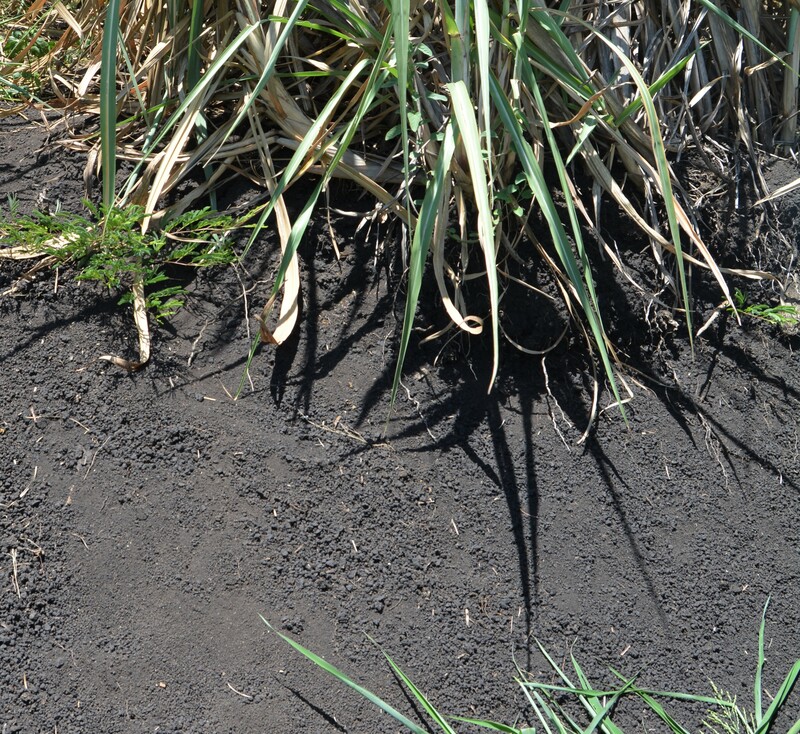 The solid and liquid excrement can be used to fertilise crops. Organic waste and water – basically the diet of live cattle plus some extras. David is currently using maize, grass cuttings and cane tops but is always testing different matter inc mac shells (which are a little too husky). Cattle and chicken manure are also viable feeds but remember that about half the sugars have already been removed from this matter, by the animal that digested it first, so you are left with a 50% food source as opposed to raw input which still has 100% of the energy available for the concrete cow stomach to extract. This biogas plant of David’s requires about 1 tonne of ‘food’ per day to supply the electricity he requires. If not already cut small, like grass cuttings, the organic matter needs to be mulched down with a shredder. See this as the ‘teeth’ of the concrete cow, chewing up its food. Basically, this concrete cow will live on pretty much whatever live cattle can live on. Cane tops being shredded. These are then ‘fed’ to the biogas plant. When I was visiting David, they were busy testing a lime dip for this organic matter because it aids in processing by breaking down some of the fibres and is not as harmful, to the bacteria, as acids are. So, after an overnight soak in the lime solution, the ‘food’ is ready. As with all digestive systems, water is a vital component and is added to the ‘meal’. In David’s plant, this water is harvested from the building roofs and collected in a 300m3 tank. 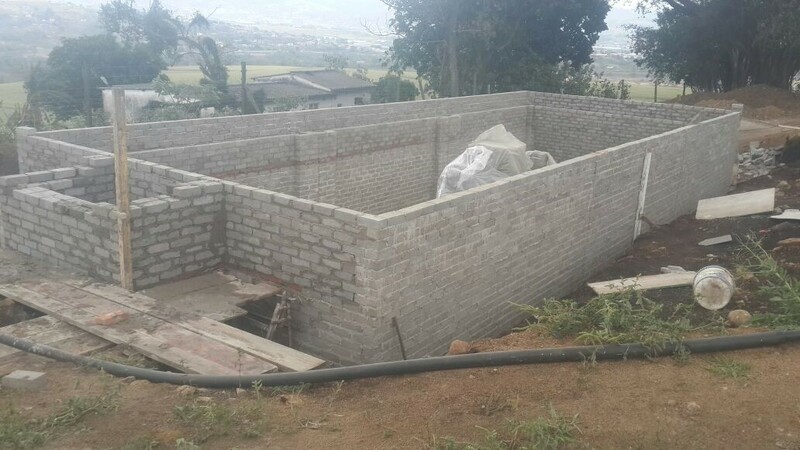 Construction of the water tank. 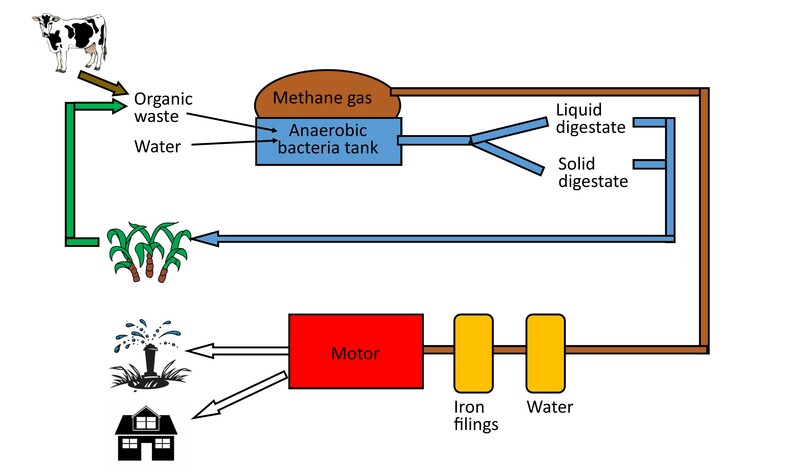 When the food (now a liquid mulch) is ready to ‘swallow’, it is pumped into the ‘stomach’ (biogas digestor) with a sewage pump, where it is digested. This tank requires temperature control to keep the bacteria healthy ie: the temperature of a live cow. The warm, feeding bacteria ‘burp’ methane gas (CH4, laced with sulphur and CO2) throughout the meal and because methane is half the molecular weight of oxygen, it rises and is captured in the balloon that sits above the digesting tank. 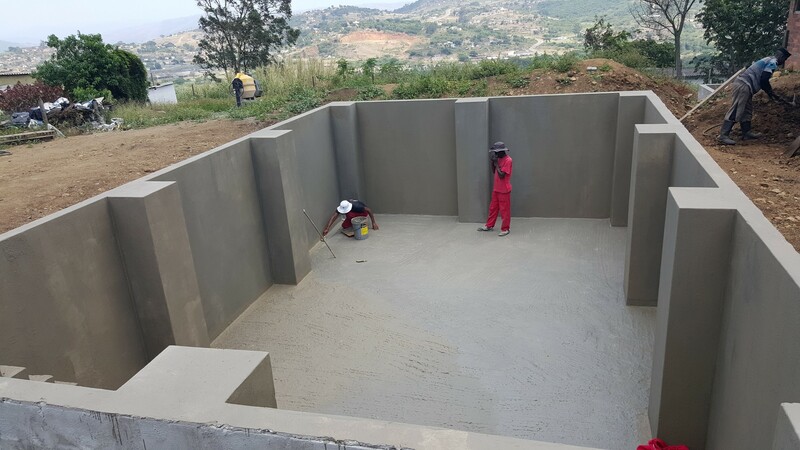 Construction of the biogas digestor tank – the bovine belly. The balloon, pictured below, sits on top of this tank. This methane-plus is tapped off and runs through black pipes (these get hot and add to the pressure of the gas) en route to a gas pump which pressurises the gas through a half-full tank of water. The CO2 molecules attach to water and is thereby ‘scrubbed’ out of the gas. Installation of the water and iron filing tanks – both look exactly the same. The remaining gas then passes through another tank that is full of iron filings. The sulphur is removed in this tank. 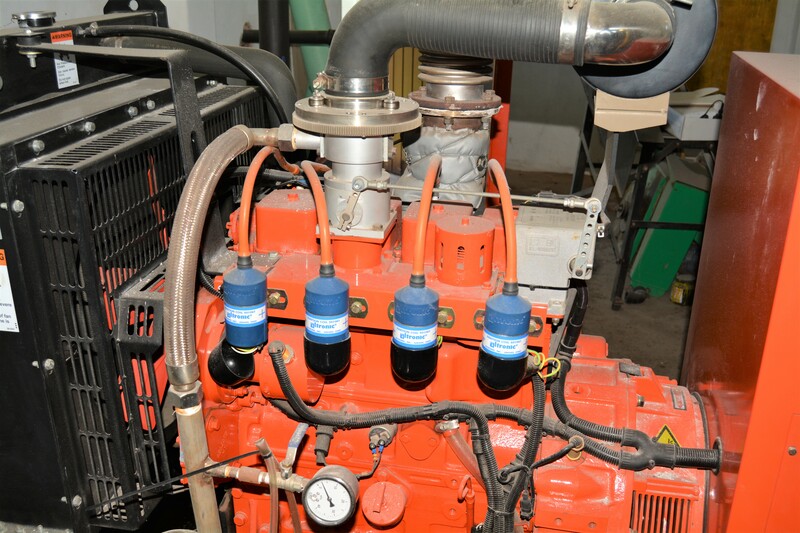 The pure methane is then passed through a mechanism that controls blow-back and into a motor that is exactly same as a normal petrol or diesel engine, in this case it’s a 4-stroke Cummins, fitted with a deep sea electronic regulating valve. There are no carburettors as the ‘fuel’ doesn’t need to be vapourised – it’s already gas and is fed directly into the cylinder. To put it plainly, the engine is running on something similar to the smell of an oil rag; it’s running on farts. 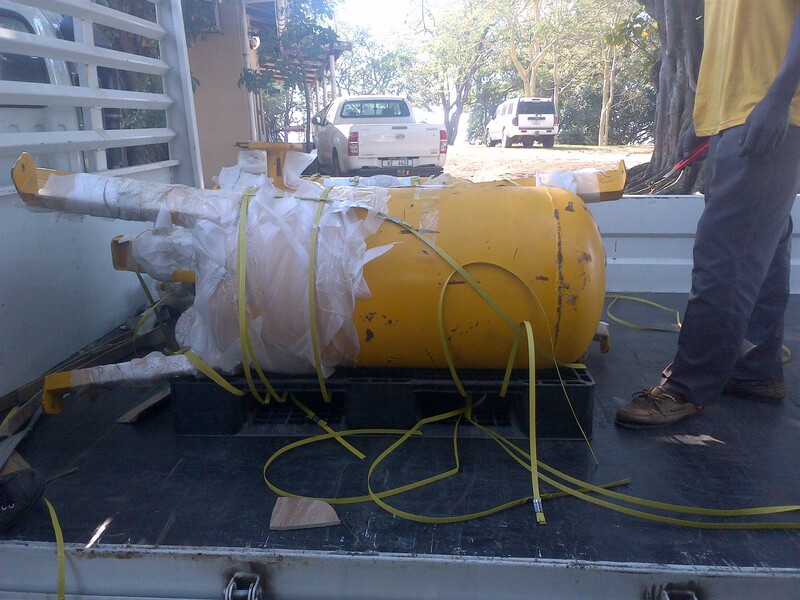 The engine is silent and runs very smoothly, spinning the generator which then produces about 30kW. As the house only consumes about 5kW, there is excess and the plant therefore runs when required. Besides electricity, this plant also produces a high quality organic fertiliser which is superior to the manure of live animals; nutrients in the form of vitamins and minerals are taken from food by a live animal but a concrete cow doesn’t extract these nutrients and they remain available in the biogas digestate (concrete cow manure). This can be used on plant crops and the liquid portion (urine) of the digestate can be used to fertigate. David plans to produce organic macs using these organic fertiliser sources. The test results have been remarkable (as seen in the mac growth, detailed above). 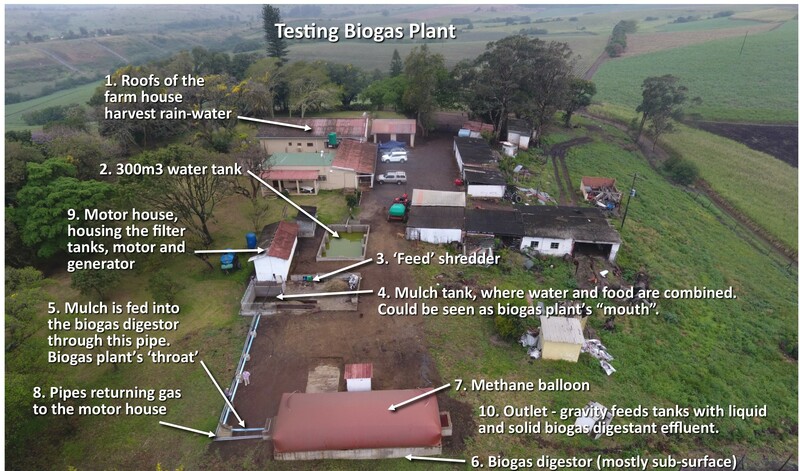 Input of 1 tonne of organic matter into a biogas plant will produce 1 tonne of digestate which would be enough to provide supplementary fertiliser to 1 hectare of sugarcane. This entire plant requires energy in two places, apart from that, it is all gravity-driven. 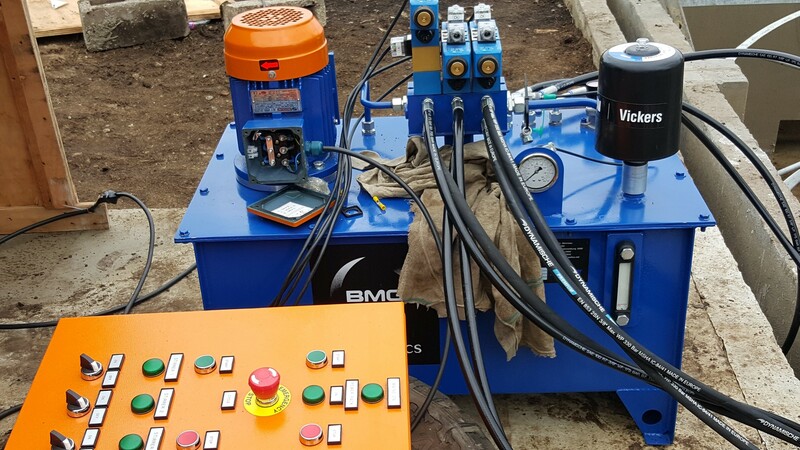 Firstly, the sewage pump that moves the liquid ‘food’ into the ‘stomach’ and, secondly, to power the gas pump that pressurises the gas into the motor. There is a water seal around the balloon, preventing the escape of gas. This is better than a mechanical seal as it requires no maintenance. It is a 300mm deep well that provides a 0,5 psi seal. You also needn’t worry about having another “mouth to feed” when you go away; this one doesn’t have to be fed for 6 months and the bacteria will survive. But, even if it does die, you only need to get fresh digestive from the rumen of a freshly slaughtered animal to be back in business. For any livestock farmer, this is an attractive way to deal with animal waste, generate electricity and have organic fertiliser for their own or commercial use. You do not have to rest the digestate (organic fertiliser) as you would normal kraal manure because the volatile Nitrogen and Sulphur have been scrubbed in the gas. He does advise though, that if you’ve used chicken litter to ‘feed’ the plant, test the digestate on your lawn before applying it to your crops. Pig manure is not perfectly suitable as it is quite high in sulphur which damages the biogas plant equipment. David feels that this damage might be mitigated by mixing the manure with enough grass. If your interest has been piqued and you’re wondering about the costs, setting up a plant the size of this test facility would cost about R1,5 million. Considering that it produces more than enough electricity to cover the requirements of an average size farm and would supply you with copious amounts of high quality organic fertiliser, it’s certainly worth considering. To find out more, you only need to approach the Innovations Group at SACG. What I found even more exciting about this completely renewable energy source is the fact that this fuel can be liquified and used as biofuel for vehicles. This brought us around to discussing ethanol as a fuel and I am probably the only ignoramus that didn’t know that South Africa used this product extensively in the 1940’s. Union Spirits provided all the fuel for all the military vehicles during the war. They were based in Durban and produced the ethanol from sugarcane. Besides the military, half the civilian vehicles ran on it as well. The entire Japanese war effort was also fuelled by ethanol during WW2. They have no crude oil and fuel embargos turned necessity into the mother of ingenuity and they produced ethanol which even powered their airforce. No, this technology certainly isn’t new, but possibly highly underutilised …. David is a people-person. The colourful Zululand community has won him over; his genuine love for the area, and the people, is inspiring. He even plans to write a book on the characters he has met here … apparently the stories are endless. Back in 2013, he found himself facing a situation that threatened his community. True to form, he raised up to the challenge and has ended up with a model so successful that I think the details are worth sharing for other threatened agricultural-based communities to emulate. It all started when a major cane haulier decided to sell off its business. 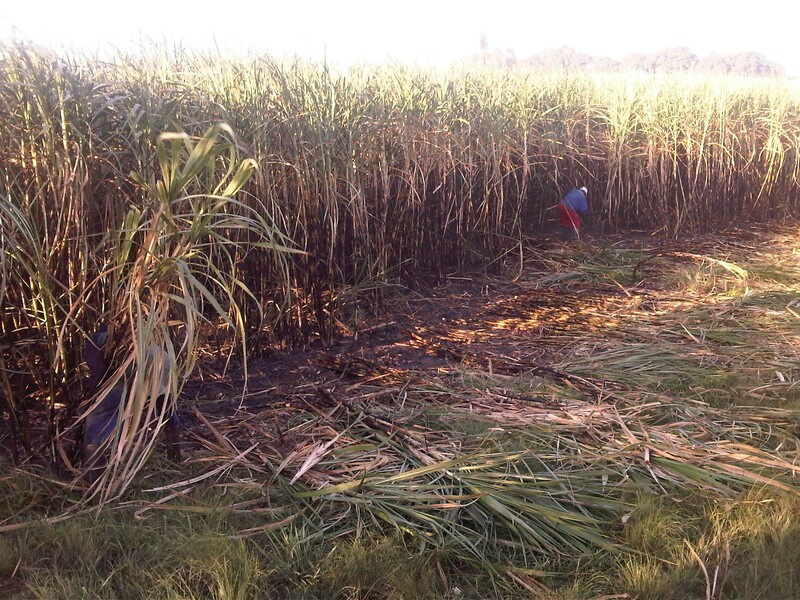 They were down to 30 000 tonnes of cane and felt it was no longer worth their while. The prospective purchaser planned to service the commercial growers but not the small-scale growers, saying that the substandard roads, leading to most small-scale growers’ loading zones, made that market nonviable. With only a month before the season opened, they would be left without a means of getting their cane to the mill. Not only was this an injustice, it would also undermine the sustainability of the mill and the entire area. David contacted the sellers and offered to buy the company. Naturally, they questioned his capacity for a purchase this size, but he had a plan and managed to get a 30 day stay of execution. David called the farmers together and proposed that they all chip in and buy the trucking company themselves. The plan was that, with 1,5 million tonnes delivered to the Amatikulu mill annually, they would offer out 1,5 million shares to all the farmers. Each farmer could then buy shares on a pro rata basis, according to his allocation. ie: a farmer delivering 10 000 tonnes annually could buy 10 000 shares in the company. Everyone, across the board, from the very smallest to the biggest, was offered the same deal. If someone couldn’t afford to pay cash, they signed a 3-year cession. There was almost a 100% buy in from the area, in fact, only 4 (of 4000) small scale growers and 2 (of 80) commercial growers, from Melmoth to the Tugela River, opted not to participate. The 6% unbought stock meant that another 100 000 shares were available, and these were offered to the farmers, again, on a pro rata basis. 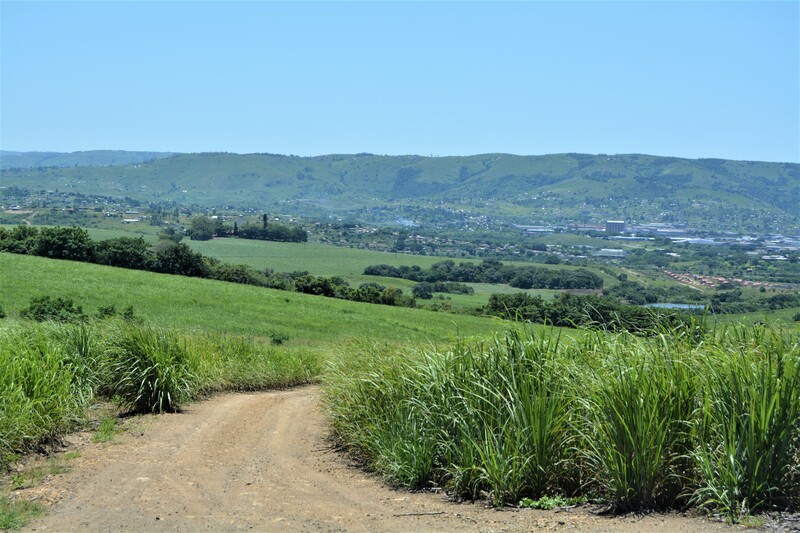 Thus, the purchase price plus R4 mill in start-up capital was raised within the 30 days and Zululand Agricultural Holdings geared for business. On 1 March 2013, they started with 300 000 tonnes (for the season), 13 trucks and 15 trailers, all in very poor condition; no fuel, bald tyres, no COR’s, and they had to be up and running by 6 April when the mill re-opened. What followed was a wonderful collaboration by all of the new business owners; everybody got stuck in. Farmers rolled up their sleeves and went to work, repairing trucks and making sure that they were ready to roll, on time. It’s an amazing success story and today, ZAH has 66 trucks and delivers 1,5mill tonnes of cane to the Amatikulu mill annually. They’ve just opened a depot in Darnall, already doing 350 000 tonnes there with the same business model of farmer ownership. Felixton is also getting involved. I was surprised to hear that when ZAH took over, the transport rate was lower than it had been with the previous company. “How?” was my obvious question, especially if that company had not been making enough money to keep the lights on. David explains that the Ubuntu principle powers this business-model. The company is carefully staffed and the owners, all 4000+ of them, have their eyes on it all the time. It’s amazing what a difference it makes when the owners are the business, instead of sitting in distant, airconditioned office in Gauteng. 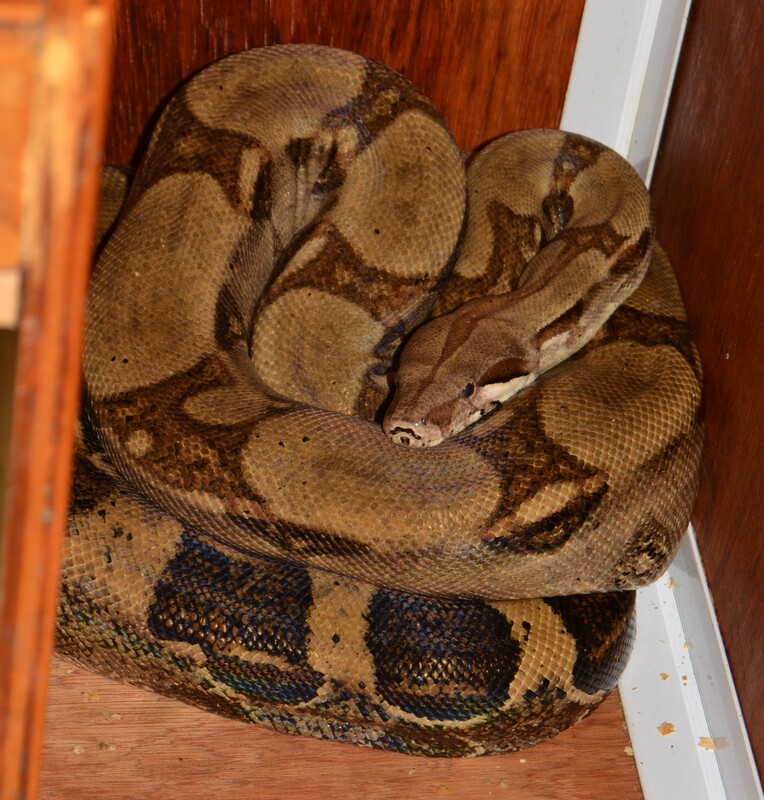 ZAH has been growing at 100% every year, over the last 5 ½ years. In 2018 they turned over R90 mill and that’s set to increase by about 20% in 2019. They’ve now hired a full time CEO, which frees David up for the ‘nose-in, hands-off’ position of Chairman. He is busy directing the strategic path of the company which currently entails 12 different acquisitions. 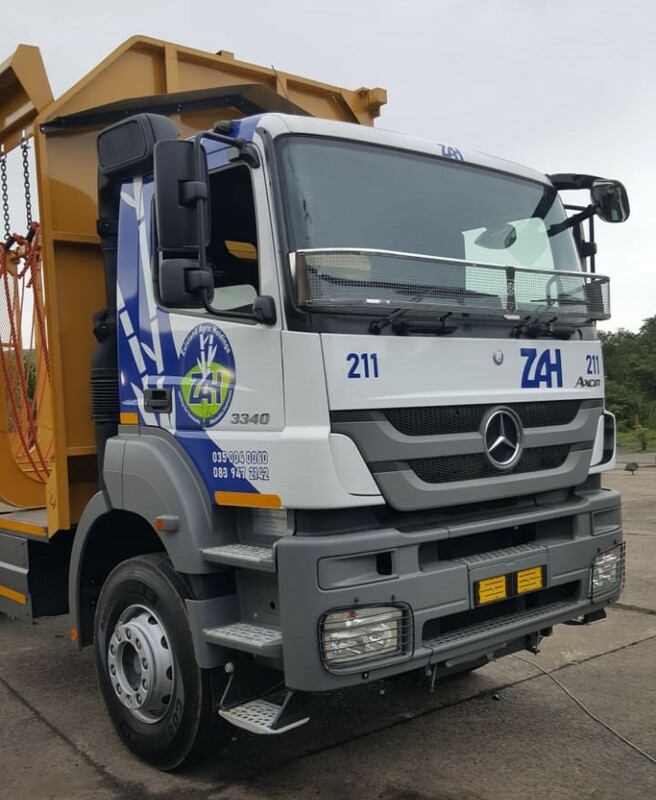 By including fuel, tyre, roadworthy centres and insurance suppliers into the fray, ZAH can further stimulate and protect the local economy and secure sustainability for the shareholding farmers by enabling them to lower their input costs. Eg: ZAH is in the process of securing a fuel retail licence. This will allow their shareholders (especially the small-scale growers) to leverage off their bulk-buying power and buy small quantities of fuel at a wholesale price. Sustainability, not profitability, is the goal. By recirculating money within the local sugar industry, which is the life-blood of this community, it will build itself. No more syphoning into the far-off white-collared metropolises. The community (including both large- and small-scale farmers, working alongside each other) becomes its own generator and benefactor – which is the core of sustainability. I had to ask where David is getting all these additional hours in his day; he even found time to humour this eager SugarBytes fan wanting to capture his secrets. It seems that Estienne is his secret weapon, at least when it comes to keeping his farming operations excelling. This hard working, diligent and committed youngster has been with David for about 5 years now. The sincerity is genuine when David says he could never manage without this dynamo manager, and I believe him, especially when I learn that David also dabbles in forex and is an international biogas consultant. That’s besides his property development projects. It’s all I can do to stop myself gaping! 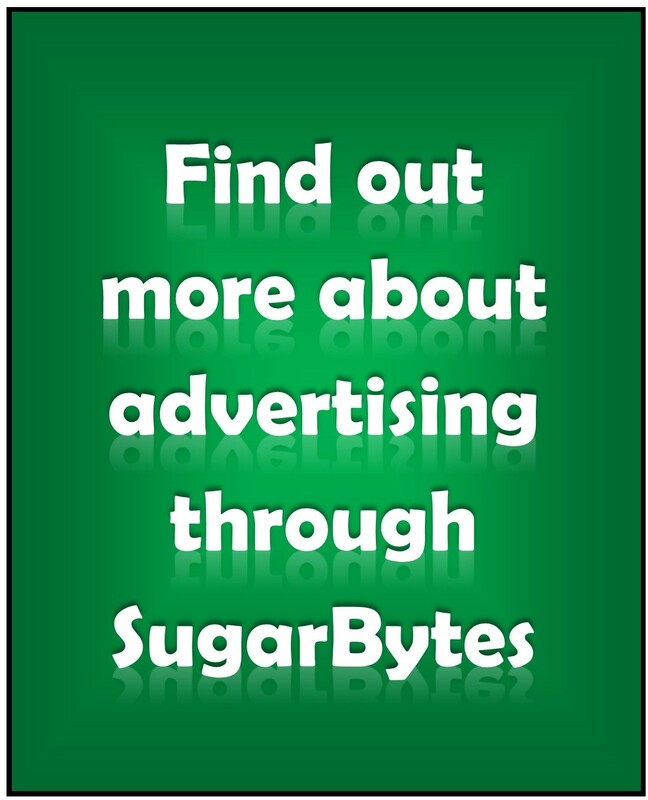 I barely have time to publish a SugarBytes article once a fortnight and get dinner to the table on time! And I haven’t even mentioned that David is on the Board of Directors for SACG, (which enlists him on 12 different committees). 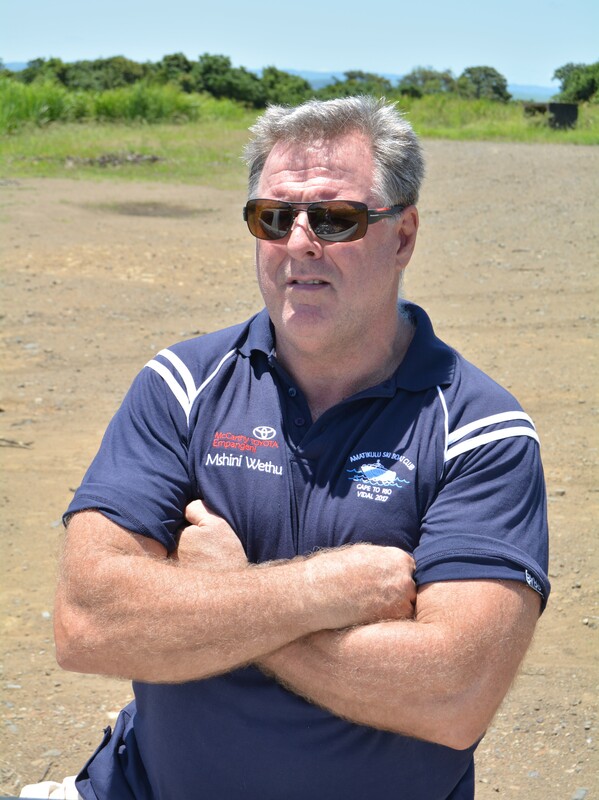 He’s also on board of SASA and the SSG Trust in the area and Chairman of the LGC. Quite honestly, I had to glance down, just to check whether he was wearing his underpants on the outside! Seriously though, some of the administrative roles David is running with at the moment are heavily-laden with current industry politics and I really marvelled at his capacity and patience. He shares a quote that has made an impact on his understanding of the situation we’re all in: “When the true extent of economic failure becomes apparent to the masses, political ideology and rhetoric will always, always fail.” Unpacking this for me, he explains that it won’t be long before the true extent of damage is realised by the masses and, at that point, we will move into a new phase; a phase where action is required as talk will no longer be tolerated. As a man of action, he’s looking forward to it. True to this mission, David leaves us with one last valuable ‘pearl’; “In agriculture, timing is EVERYthing. There are probably only 10 or 15 good spraying (herbicides) days in a year. The same goes for fertiliser application and ripeners. If you get your timing perfect, the whole production cycle goes far better and, in most instances, you can save tremendously by not having to go back and reapply. Lorraine, David and Kellan David and Grant, his son. Meet Sausage, who handles security on the farm and robbed me of most of my attention throughout the interview.